Hike to the top of Amicalola Falls, the tallest waterfall in Georgia, and catch incredible mountain views on the East Ridge Trail and Appalachian Approach Trail loop. Amicalola Falls drops over 730 feet, cascading in multiple tiers of white, misty, falling water from a towering cliff in Georgia’s Chattahoochee National Forest. This hike makes a one-mile journey to the crest of this enormous waterfall, grabbing stunning views from the top before descending alongside the falls along bridges and stairs. Amicalola Falls is one of Georgia’s most popular state parks, so expect some company on the trail, especially on fair-weather weekends. 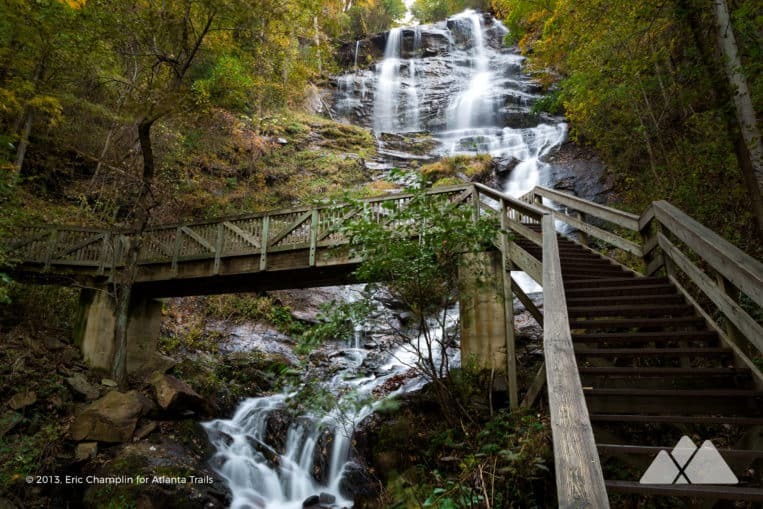 While this hike explores some of the park’s lesser-traveled areas on this two-trail loop, the waterfall’s crest and stairs can often be busy with hikers and photographers. We usually try to catch the best views and photos of the falls in early mornings before the crowds arrive. It’s a great hike in just about any season: draped in a dusting of snow, framed by springtime wildflowers, or lined with the vibrant greens of summer. But the waterfall is particularly beautiful in autumn, framed against a vibrant backdrop of fall leaves, when the surrounding trees explode into vibrant autumn color. The hike begins at the Amicalola Falls State Park visitor center (view maps and driving directions). The route passes under a stone arch marking the beginning of the Appalachian Trail Approach Trail, a 10 mile hike to the Appalachian Trail’s southern end on Springer Mountain. The hike climbs through a young hardwood forest, carving through wide switchbacks and then reaching a gravel road at .6 mile. The route turns left, following the gravel road northbound. 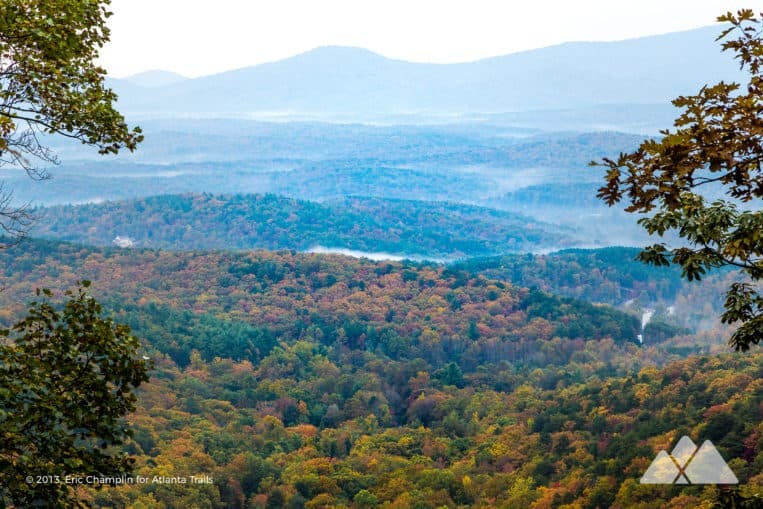 Stunning views of the surrounding mountains emerge on the trail’s left side as the hike climbs elevation, a view that’s especially beautiful in the autumn as colorful leaves dot the landscape. 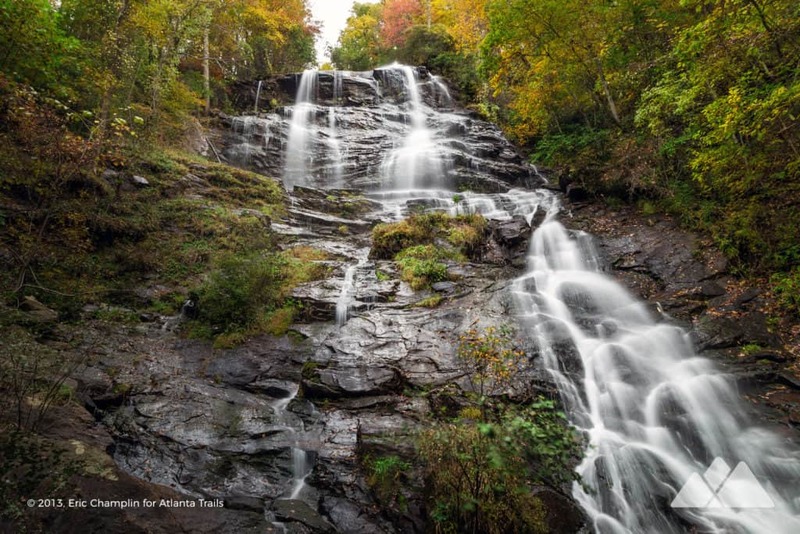 The sounds of the nearby plunging waterfall become audible as the trail rises toward the crest of Amicalola Falls. The trail reaches a paved parking area at 1 mile, having climbed 725 feet from the trailhead. The hike turns left in the parking area, following signs to the waterfall overlook. The trail crosses a bridge spanning the crest of the falls, catching incredible far-flung views of the southern Appalachian Mountains to the south. 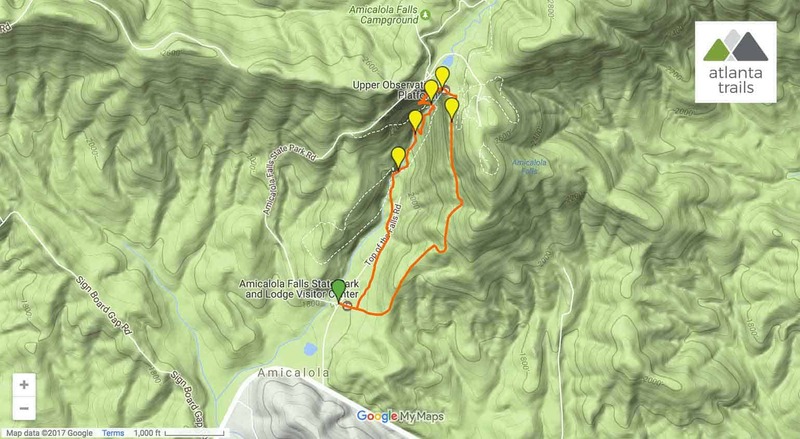 The hike turns left at 1.1 miles, descending the western side of Amicalola Falls via a system of stairs and landings, and then reaches a paved pathway. The hike turns left on the pathway, crossing a bridge spanning the waterfall’s upper third. The waterfall cascades in multiple streams from the sheer rock face above, tossing mist and spray in a continual breeze down onto the bridge. The hike continues its descent, following stairs and landings and catching uninterrupted views of the waterfall as it cascades over a rocky, boulder-filled bed through the forest. The trail levels briefly at 1.25 miles, reaching the last set of stairs. A paved trail parallels the waterfall’s lower cascades, offering up-close views of the creek as it spills over tumbled boulders in small cascading waterfalls. The continually spilling, tumbling creek levels into the tranquil waters of a reflective pool at 1.5 miles. 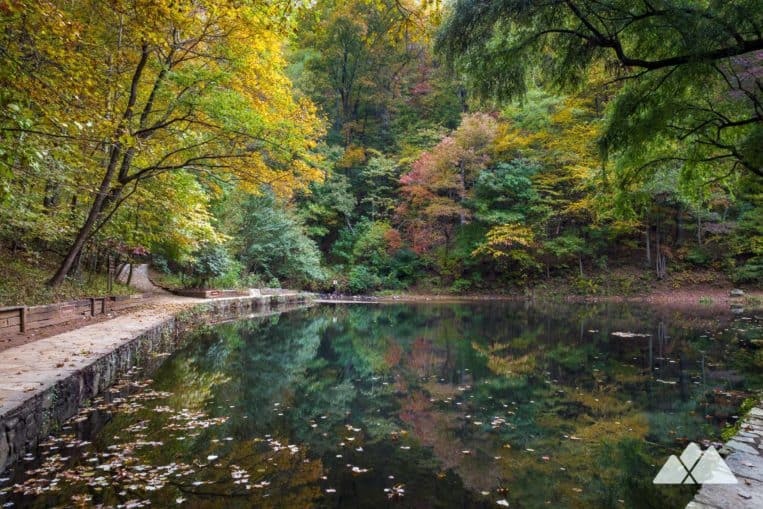 The calm pool offers reflections of the surrounding trees, and makes a great place for a mid-hike snack or water break. Following a blue-blazed trail, the hike departs the pond, winding through a young forest and following the continually tumbling creek downstream. 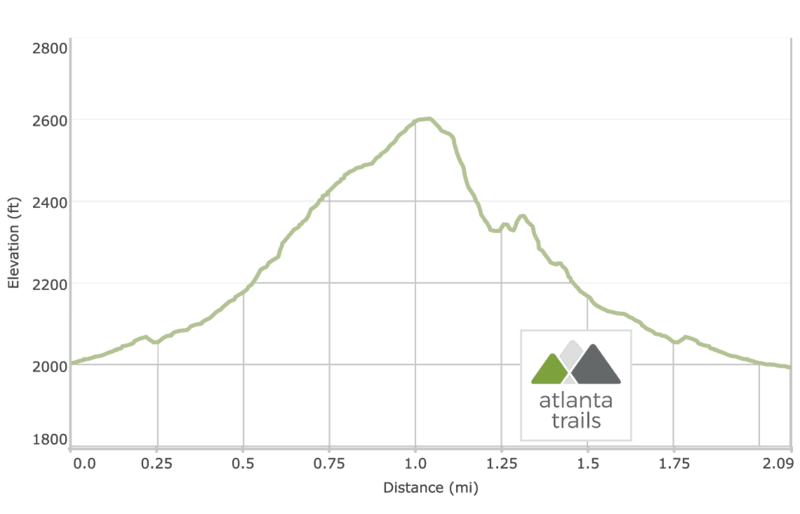 The trail levels, passing through a picnic area and playground, and reaches the trailhead at 2.1 miles, completing the adventure. In the area with energy and daylight left? 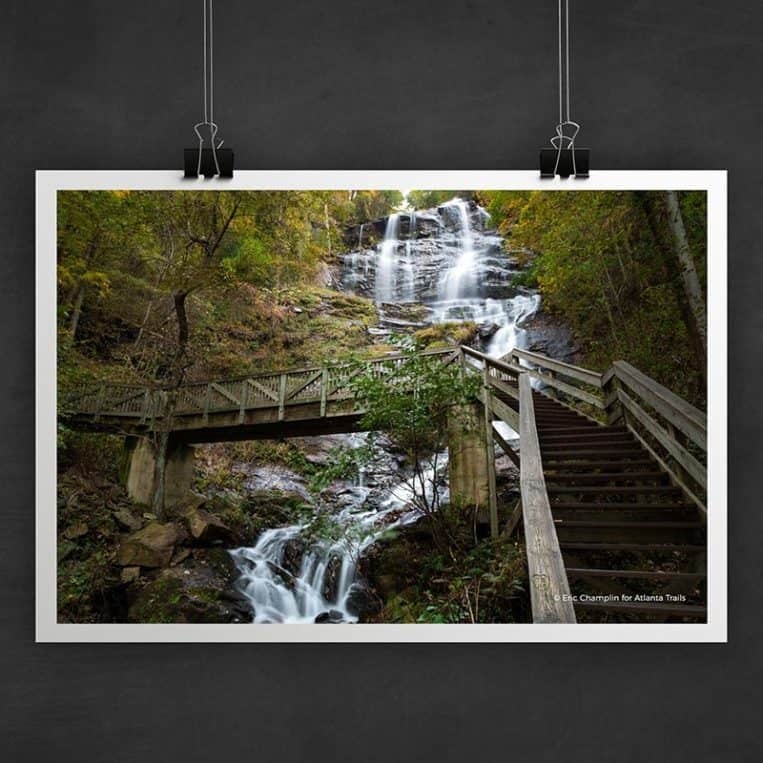 Check out our Amicalola Falls State Park guide for more ways to explore and adventure in this beautiful stretch of North Georgia.